Do you have a big collection of pens that needs taming — at the office, at home or in a store display. Our attractive pen holders, tubes and displays offer a great solution — your pens are cleanly separated into groups but their colors and designs still show through. 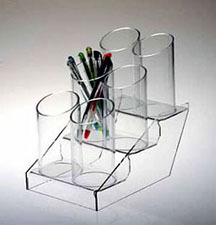 Our pen holders are made in the US out of sturdy, high-quality polished clear acrylic. Most are in stock and ready to ship.